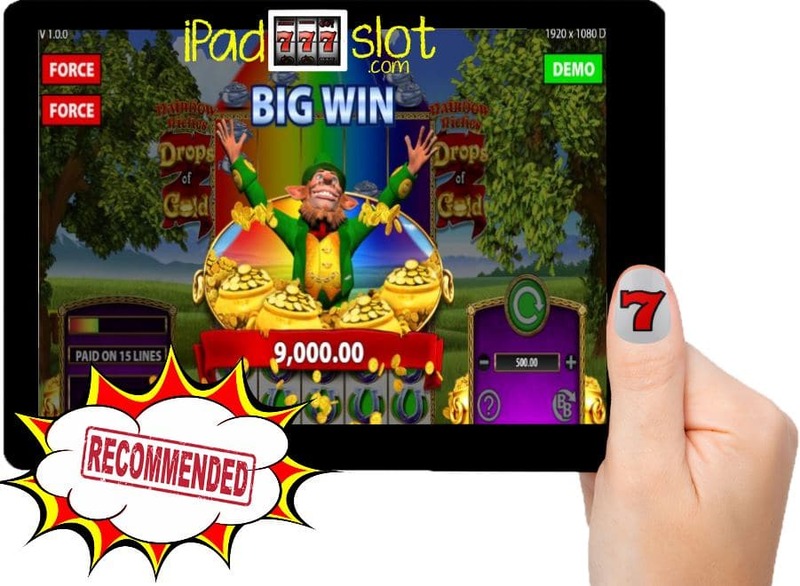 SG Interactive continues dropping some captivating titles in the Rainbow Riches slot series and this time around, SG Interactive has released Rainbow Riches Drops of Gold into the Barcrest Studio range of games that are mobile compatible for iPad, iPhone and Android casino players. Like other slot games in the Rainbow Riches slot series, this new game comes with a nature theme. To start your adventure in Rainbow Riches Drops of Gold, all you need to do is to set spinning the game’s five reels that come with 50 paylines (standard game) and 200 paylines (Big Bet game). The background of this slot game depicts a beautiful plain. The reel set of this game come in a 5×4 design. On top of the reel set is another set that’s filled with Drops of Gold pots while on top of this additional reel set is a hut-like structure. When spinning the reels of Rainbow Riches Drops of Gold, players will find the following symbols on the reels: the game logo icon, mushroom, a guitar, a red icon, horseshoe, and traditional card symbols. Game logo icon: The highest paying symbol in the game is the game logo icon. For matching five of these the player is awarded a 250x multiplier (standard game) and a 1000x multiplier (Big Bet game). 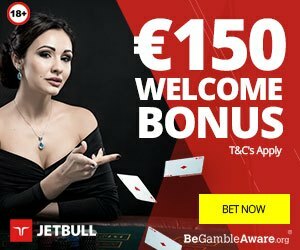 for matching four of these the player is awarded a 50x multiplier (standard game) and a 200x multiplier (Big Bet game) and for matching three of these the player is awarded a 25x multiplier (standard game) and a 100x multiplier (Big Bet game). Mushroom: The second highest paying icon in the slot is represented by the mushroom. For matching five of these the player is awarded a 200x multiplier (standard game) and an 800x multiplier (Big Bet game). For matching four of these the player is awarded a 40x multiplier (standard game) and a 160x multiplier (Big Bet game). For matching three of these the player is awarded a 20x multiplier (standard game) and an 80x multiplier (Big Bet game). Guitar: The third highest paying icon is the guitar. For matching five of these the player is awarded a 150x multiplier (standard game) and a 600x multiplier (Big Bet game). For matching four of these the player is awarded a 30x multiplier (standard game) and a 120x multiplier (Big Bet game). For matching three of these the player is awarded a 15x multiplier (standard game) and a 60x multiplier (Big Bet game). Red icon: The red icon carries the game’s fourth-highest prize. For matching five of these the player is awarded a 125x multiplier (standard game) and a 500x multiplier (Big Bet game). For matching four of these the player is awarded a 25x multiplier (standard game) and a 100x multiplier (Big Bet game). For matching three of these the player is awarded a 10x multiplier (standard game) and a 40x multiplier (Big Bet game). Horseshoe: The horseshoe carries the game’s fifth-highest prize. For matching five of these the player is awarded a 100x multiplier (standard game) and a 400x multiplier (Big Bet game). For matching four of these the player is awarded a 20x multiplier (standard game) and an 80x multiplier (Big Bet game). For matching three of these the player is awarded a 10x multiplier (standard game) and a 40x multiplier (Big Bet game). Traditional Card Symbols: The traditional card symbols pay the least in this slot. For matching five of a kind the player is awarded up to a 75x multiplier (standard game) and 300x multiplier (Big Bet game). For matching four of a kind the player is awarded up to a 15x multiplier (standard game) and a 60x multiplier (Big Bet game). For matching three of a kind the player is awarded a 5x multiplier (standard game) and a 20x multiplier (Big Bet game). Wild: The silver and the gold pots of gold act as the wild symbols. 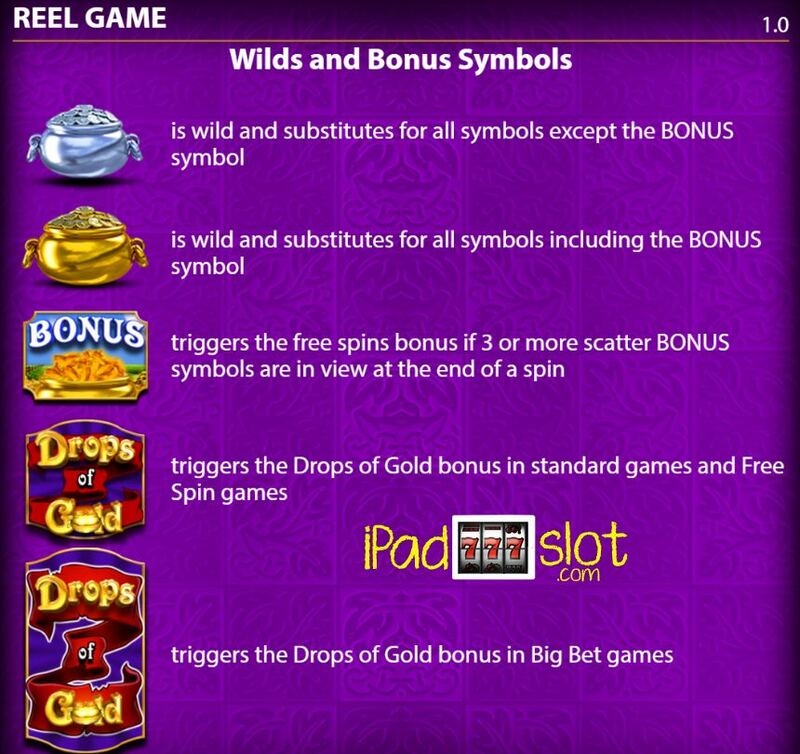 Therefore these two wilds can substitute for any other icon on the reels bar the scatter and the bonus symbols. Scatter: The scatter icon is represented by the Drops of Gold icons. Bonus Symbol: The bonus symbol is represented by the icon written BONUS. This feature is triggered when the player lands three bonus symbols. The player receives 8 free spins. 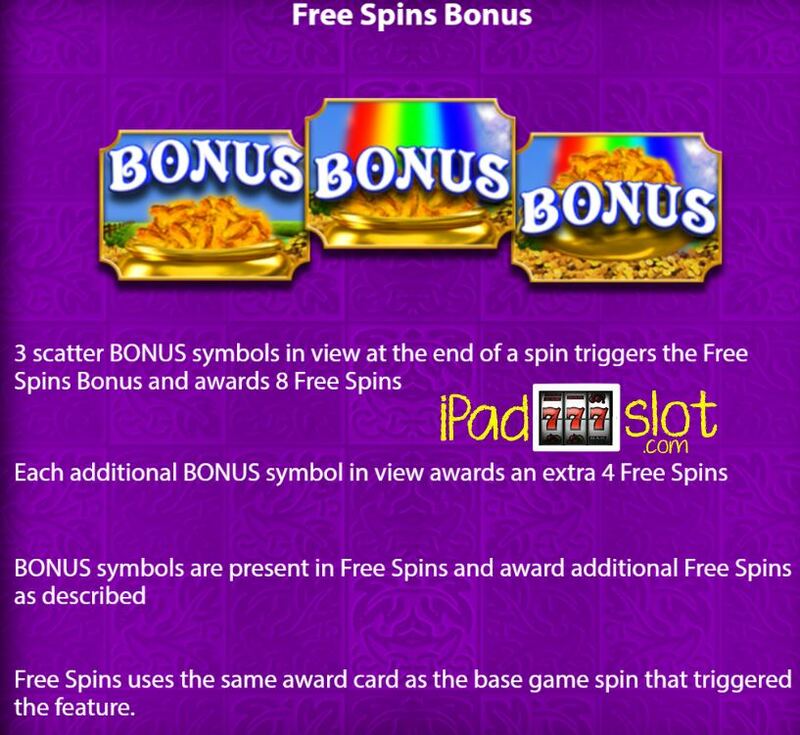 For every bonus symbol that pops up during this feature, the player is awarded 4 additional free spins. This feature is activated when the Drops of Gold scatter symbol pops up on reel 5. All Drops of Gold scatter icons on the upper reel set will drop to the main rel set and occupy their corresponding positions. If the Drops of Gold scatter drops in a position occupied by a silver wild, it will be transformed into a gold wild. This slot comes with the Big Bet Feature which allows players to wager with high bet amounts in exchange for potentially more ways to win. This feature is available at 20.00, 30.00 and 50.00 stakes. 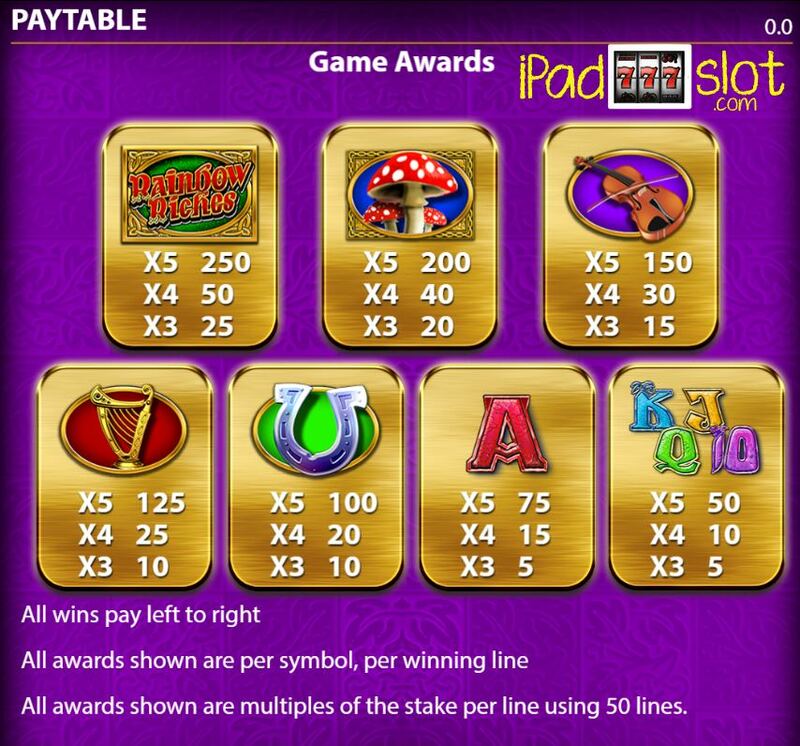 In the 20.00 coin Big Bet game, the upper reel set will be occupied by slightly more Drops of Gold symbols. In the 30.00 coins Big Bet Game, lower paying symbols (traditional card symbols) are removed from the reels hence the player will spin only high-value symbols. In the 50.00 coins Big Bet game, there will be more Drops of Gold icons on the upper reel set, low-value icons are removed from the reels and all the 200 paylines are activated – how amazing is that! Rainbow Riches Drops of Gold is a medium volatility game which is appealing to play due to the numerous bonus rounds that it comes with. Out of a 10 point rating, this game comes with a 9 point rating in our Barcrest online slot reviews.